Sculpture in Stone (MFA), no. 406; Sculpture in Stone and Bronze (MFA), p. 117 (additional published references). 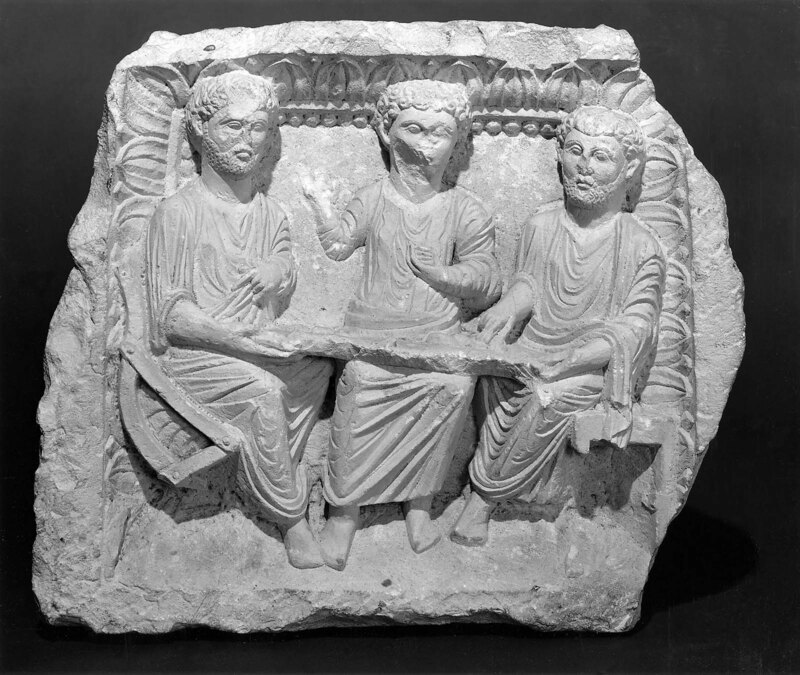 This relief shows three men seated around a gaming table. The bearded man on the left watches the checkers or chips; the bearded man on the right is moving one in front of him; and the man in the center holds a stack in his left hand, the right hand raised in the Late Antique gesture of victory, or of a consul giving the signal for circus games to begin. As prosperous citizens of a caravan city famed for its commercial enterprise, these men doubtless enjoyed being shown sculpturally, perhaps in a family tomb complex. The gesture the first bearded man makes with his left hand, index and pinkie fingers extended, is similar to those in Palmyrene funerary relief portraits. The deceased might have been the young man (acting as judge?) in the center, and the other two, older men his business associates or his father and uncle, since Palmyrene tomb chambers were largely dynastic. Symbolically speaking, the game could be “the game of life,” and the victory thus could be suggestive of eternal happiness in an elysium of gaming and tabernae (bars). Students of ancient furniture will find the articulated chair at the left an example of unusual domestic craftsmanship. The linear drapery and tilted perspective present Palmyrene sculpture at its Greek imperial best, foreshadowing aspects of popular art in both East and West at the outset of the Middle Ages. The condition is good. The edges of the frame have been damaged. The noses of all three men, the forehead of the man at the left, the side of the face of the man in the center, and the legs of the chairs or stools have suffered. By 1967 in the possession of the antiquities dealer, Faoud Alouf, in Beirut, according to Harald Ingholt; by 1970: with Münzen und Medaillen A.G., Malzgasse 25, Basel, Switzerland; May 13, 1970: purchased by MFA from Münzen und Medaillen, A.G.